Evolution in extreme environments has produced life forms with amazing abilities and traits. Beneath the waves, many creatures sport iridescent structures that rival what materials scientists can make in the laboratory. A team of researchers from the University of Pennsylvania (Penn) and the University of California, Santa Barbara (UCSB), has now shown how giant clams (image) these structures to thrive, operating as exceedingly efficient, living greenhouses that grow symbiotic algae as a source of food. This understanding could have implications for alternative energy research, paving the way for new types of solar panels or improved reactors for growing biofuel. The study was led by Dr. Alison Sweeney, assistant professor in the Department of Physics and Astronomy in Penn's School of Arts & Sciences, and Dr. Daniel Morse, professor emeritus in UCSB's Department of Molecular, Cellular and Developmental Biology and Director of its Marine Biotechnology Center. The team also includes lead author Dr. Amanda Holt, a postdoctoral researcher formerly at UCSB and now at Penn, as well as Dr. Sanaz Vahidinia of NASA's Ames Research Center and Dr. Yakir Luc Gagnon of Duke University. The work was published online on October 1, 2014 in the Journal of the Royal Society Interface. "Many mollusks, like squid, octopuses, snails, and cuttlefish," Dr. Sweeney said, "have iridescent structures, but almost all use them for camouflage or for signaling to mates. We knew giant clams weren't doing either of those things, so we wanted to know what they were using them for." While the true purpose of these iridescent structures, cells known as iridocytes, was not known, the team had a strong hypothesis. Like neighboring coral, giant clams are home to symbiotic algae that grow within their flesh. Glioblastma multiforme (GBM) is one of the most lethal primary brain tumors, with median survival for these patients only slightly over one year. Researchers at Boston University School of Medicine (BUSM), in collaboration with researchers from the City of Hope Hospital in Los Angeles, California, are looking toward novel therapeutic strategies for the treatment of GBM in the form of targeted therapies against a unique receptor, the interleukin-13 receptor alpha chain variant 2 (IL13Ralpha2). In a review article published in the October 2014 issue of Neuro-Oncology, the researchers discuss various targeted therapies against IL13Ralpha2 and early successes of clinical trials with these therapies in the treatment of GBM. The article also highlights the need for future trials to improve the efficacy and toxicity profiles of targeted therapies in this field. Targeted therapies, which are drugs that interfere with specific molecules involved in cancer growth, have been successfully used in the treatment of many cancers, including breast and blood cancers. Successful targets for therapies are specific to tumor cells and not found on normal cells. Selectively expressed on GBM and absent on surrounding brain tissue, the interleukin-13 receptor alpha chain variant 2 (IL13Ralpha2) was identified as a potential target for therapy for GBM two decades ago. IL13Ralpha2 also plays an important role in the growth of tumors. In normal physiologic conditions, IL-13 binds to the receptor IL13Ralpha1 and helps regulate immune responses. In cancer cells, IL-13 binds to the receptor IL13Ralpha2 and, through a series of steps, prevents cancer cells from undergoing normal cell death. Increased expression of IL13Ralpha2 promotes the progression of GBM. Since its discovery, IL13Ralpha2 has provided a target for therapies in GBM. The cause of fibromyalgia, a chronic pain syndrome, is not known. However, the results of a new study that compares brain activity in individuals with and without fibromyalgia indicate that decreased connectivity between pain-related and sensorimotor brain areas could contribute to deficient pain regulation in fibromyalgia, according to an article published in Brain Connectivity, a peer-reviewed journal from Mary Ann Liebert, Inc., publishers. The article is available free on the Brain Connectivitywebsite at http://online.liebertpub.com/doi/full/10.1089/brain.2014.0274 until November 1, 2014. The new study by Dr. Pär Flodin and coauthors from the Karolinska Institutet (Stockholm, Sweden) builds on previous findings in fibromyalgia that showed abnormal neuronal activity in the brain associated with poor pain inhibition. In the current study, "Fibromyalgia Is Associated with Decreased Connectivity between Pain- and Sensorimotor Brain Areas," the researchers report a pattern of "functional decoupling" between pain-related areas of the brain that process pain signals and other areas of the brain, such as those that control sensorimotor activity in fibromyalgia patients compared to healthy patients, in the absence of any external pain stimulus. As a result, normal pain perception may be impaired. "Fibromyalgia is an understudied condition with an unknown cause that can only be diagnosed by its symptoms," says Christopher Pawela, Ph.D., Co-Editor-in-Chief of Brain Connectivity and Assistant Professor, Medical College of Wisconsin. He was not involved in the current study. "This study by Flodin et al. Along rivers in Tennessee and Georgia, scientists have been studying brownish-orange spiders, called Anelosimus studiosusm (image), that make cobwebby nests “anywhere from the size of a golf ball to the size of a Volkswagen Beetle,” researcher Dr. Jonathan Pruitt says. The individual spiders are only the size of a pencil eraser, but they form organized groups that can catch prey ranging from fruit flies to small vertebrates. “We have found carcasses of rats and birds inside their colonies,” Dr. Pruitt says. Unlike most spiders, which are solitary, these social spiders work together in groups. Now new research shows that they evolve together in groups, too. Mention the term “group selection” among some groups of evolutionary biologists and you won’t be invited back to the party. 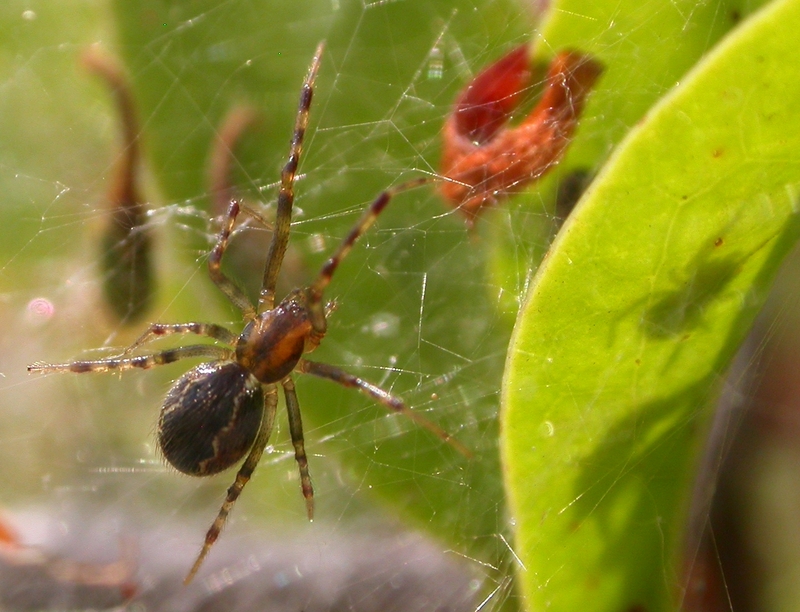 But Dr. Pruitt, at the University of Pittsburgh, and Dr. Charles Goodnight, at the University of Vermont, have been studying generations of these Anelosimus spiders — and have gathered the first-ever experimental evidence that group selection can fundamentally shape collective traits in wild populations. Their results were published online on October 1, 2014 in Nature. “Biologists have never shown an adaptation in nature which is clearly attributable to group selection,” Dr. Goodnight said. “Our paper is that demonstration.” In his 1859 masterpiece, “On the Origin of Species,” Charles Darwin puzzled over how ants could — generation after generation — produce workers that would serve the colony — but were sterile. Evolution by natural selection has often been understood to work at the level of the organism: the traits of an individual determine whether it will survive and reproduce. How could these sterile ants persist in nature, he wondered, if they didn’t reproduce? Biological sensors, or biosensors, are like technological canaries in the coal mine. By converting a biological response into an optical or electrical signal, they can alert us to dangers in our external and internal environments. They can sense toxic chemicals and particles in the air and enzymes, molecules, and antibodies in the body that could indicate diabetes, cancer, and other diseases. An optical biosensor works by absorbing a specific bandwidth of light and shifting the spectrum when it senses minor changes in the environment. The narrower the band of absorbed light is, the more sensitive the biosensor. “Currently, plasmonic absorbers used in biosensors have a resonant bandwidth of 50 nanometers,” said Dr. Koray Aydin, assistant professor of electrical engineering and computer science in the McCormick School of Engineering at Northwestern University in Chicago. “It is significantly challenging to design absorbers with narrower bandwidths.” Dr. Aydin and his team have created a new nanostructure that absorbs a very narrow spectrum of light—having a bandwidth of just 12 nanometers. This ultranarrow band absorber can be used for a variety of applications, including better biosensors. “We believe that our unique narrowband absorber design will enhance the sensitivity of biosensors,” Dr. Aydin said. “It’s been a challenge to sense very small particles or very low concentrations of a substance.” This research was described in the paper “Ultranarrow band absorbers based on surface lattice resonances in nanostructured metal surfaces,” published in the August 26, 2014 issue of ACS Nano. Typical absorber designs use two metal sheets with a non-metallic insulating material in between. By using nanofabrication techniques in the lab, Dr.
Research by University of California Irvine (UC Irvine) immunologists reveals new information about how our immune system functions, shedding light on a vital process that determines how the body’s ability to fight infection develops. In the online version of Nature Immunology published on September 28, 2014, neurology professor Dr. Michael Demetriou, postdoctoral scholar Dr. Raymond Zhou, and other Institute for Immunology colleagues describe a critical mechanism underlying how T-cells are created, selected, and released into the bloodstream. 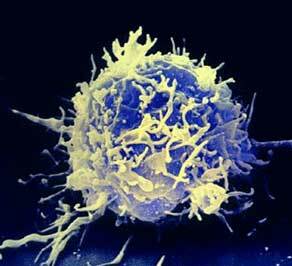 A T- cell (image) is a type of blood cell called a lymphocyte that protects the body from infection. T-cell precursors called thymocytes are created in the bone marrow and migrate to the thymus – a walnut-sized organ at the base of the neck – where they are transformed into T-cells. However, very few thymocytes become fully functional T-cells, and in the current study, the Demetriou team gained important new insights into why. As they are transformed into T-cells, thymocytes grow receptors that react to an antigen (any substance provoking an immune response) that’s bound to a small molecule called MHC major histocompatibility complex). If this reaction is too strong or too weak, the thymocyte does not mature into a T-cell. Dr. Demetriou and the others found that the delicate balance determining the proper reactive ability is controlled by glycosylation, a process in which a sugar attaches to a target protein to give the protein stability and form. They saw that changes in the addition of sugars to receptors – including the blocking of glycosylation – during T-cell development profoundly influenced how thymocytes reacted to the MHC-bound antigens and whether they became mature T-cells. Using a bio-mimicking analog of one of nature's most efficient light-harvesting structures, blades of grass, an international research team led by Dr. Alejandro Briseno, of the University of Massachusetts (U Mass) Amherst, has taken a major step in developing long-sought polymer architecture to boost power-conversion efficiency of light to electricity for use in electronic devices. Dr. Briseno, with colleagues and graduate students at U Mass Amherst and others at Stanford University and Dresden University of Technology, Germany, reported online on September 16, 2014 in Nano Letters that by using single-crystalline organic nanopillars, or "nanograss," they found a way to get around dead ends, or discontinuous pathways, that pose a serious drawback when using blended systems known as bulk heterojunction donor-acceptor, or positive-negative (p-n), junctions for harvesting energy in organic solar cells. Dr. Briseno's research group is one of very few in the world to design and grow organic single-crystal p-n junctions. He says, "This work is a major advancement in the field of organic solar cells because we have developed what the field considers the 'Holy Grail' architecture for harvesting light and converting it to electricity." The breakthrough in morphology control should have widespread use in solar cells, batteries, and vertical transistors, he adds. Dr. Briseno explains, "For decades scientists and engineers have placed great effort in trying to control the morphology of p-n junction interfaces in organic solar cells.